What is a City Landmark? A City Landmark is a site designated through ordinance that has demonstrated historic significance in the development of the City of St. Louis. City Landmarks have legal protections against demolition and inappropriate alteration, in addition to official recognition of their value to our city. St. Louis has designated 123 City Landmarks since the Board of Aldermen created the designation in 1966. 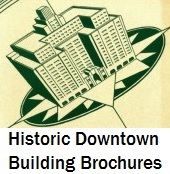 However, the last City Landmark designation occurred over five years ago. How Does a City Landmark Get Designated? A citizen or preparer completes an application form that includes a building or site description, narrative history, photographs, a site plan, and a “preservation plan” outlining what alterations would be considered to alter the historic character. That plan will guide future decisions about the building. The completed application goes to the city’s Cultural Resources Office (CRO) for review and correction. That office will present the application to the Preservation Board, a nine-member commission composed of architects, historians, engineers and citizens appointed by the mayor. The Preservation Board holds an advisory vote on the application. The final step requires support of the alderperson. The City Landmark application must be designated through ordinance by the Board of Alderman. The local alderperson will introduce a bill to make the designation official. Can More Than One Building Be Designated? Yes. Groups of as few as two or as many as several thousand buildings can be designated as a Local Historic District. The application process is similar, although the design guidelines typically are more extensive since multiple resources are included. What Happens After the Designation? All building permits for a City Landmark or Local Historic District structure go to the CRO for approval as well as the Building Commissioner. These permits would include demolition, major alterations and any changes specified in the preservation plan for the site or district. The CRO can deny the permit. The property owner can appeal CRO decisions to the Preservation Board for a hearing. The Board can uphold CRO denial or overturn it. If the owner wishes to appeal further, the matter goes to the city’s Planning Commission. If the Planning Commission does not grant the appeal, the owner can file suit in Circuit Court. Also, a few City Landmarks have been demolished following fires or structural collapse. The Building Commissioner retains the power to issue an emergency condemnation for demolition order, and the CRO has no authority to halt or override such an order. What Other Protections Exist in the City of St. Louis? CRO has review over all demolition permits in wards that participate in the city’s Preservation Review program. Before 1999, this program covered the entire city but since then wards can opt in and out. Currently, all of the 28 wards participate except eight wards (4, 5, 7, 14, 18, 19 and 22). Additionally, CRO reviews demolition permits for all buildings listed on the National Register of Historic Places individually or through districts. Is There Financial Assistance Available for Preserving City Landmarks? The federal Historic Preservation Act of 1966 allows any Certified Local Government (CLG) to apply for an obtain grant money for preservation planning, stabilization and other work. St. Louis’ CRO participates in the CLG and is eligible for federal and state preservation grant funding. However, grant requests typically are initiated by concerned citizens who approach the CRO for assistance. How Do I Contact the Cultural Resources Office? Cultural Resources Office Director Betsy Bradley can be reached at 314-622-3400×206 or via email at BradleyB@stlousicity.com.